You might think that B2F stands for “Back to the Future”. In fact, it is the acronym chosen by London Underground to signify its project to renew the track in tunnels between Baker Street and Finchley Road on the Metropolitan line. Back to the future, though, would not be a bad interpretation as the project is all about an innovative process that LU has developed, in conjunction with its partner Tarmac, and which shows promise for many more applications in the future. The task facing LU was how to replace 3.2km of life-expired bullhead rail, timber sleepered, ballasted track in seven single-bore tunnels. These range in length between 185 and 720 metres. The track drainage had largely failed and the conditions arising from that were making track maintenance increasingly difficult. 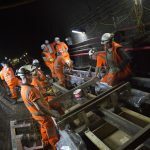 The solution that LU aspired to was to replace all the ballasted track in the tunnels with a concrete slab track form, giving the benefits of minimal maintenance requirements and a design life of 100 years. But how to achieve this economically with short track access periods on this intensively used underground line close to central London? The answer was to be found by deploying a very specific type of concrete (and by LU granting itself slightly longer night-time access periods than the norm). Tarmac, under its specialist division Pozament which provides high performance building products, had developed concrete mixes for similar situations. These had been successfully used for surface bay replacements on the M42 and M54 motorways and on runways at Birmingham International and London City airports. So Pozament was approached by LU in the latter half of 2015 to develop a modification of its concrete specification to meet some particular performance requirements. These were to not only have a good strength gain over time and to be placeable within a limited time frame, but also to achieve these within a wide temperature range from 10°C to 30°C. The newly designed mix, which would cope with this temperature range and reach a strength of 15 N/mm2 two hours after placement, was ready for the work to commence in May 2016, the start of a two year project. Roger Eke, technical sales manager for Pozament, explained that, because it was not feasible to transport a wet mix into the tunnels, LU wanted a dry concrete mix that could be produced within the tunnels and have water added close to the point of placement. 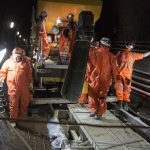 Therefore the pavement quality PQ-X mix, previously used on the M42 and other projects, was re-engineered for the specific application of the track slab in tunnels. PQ-X is mixed with 0/4mm washed sand and 4/20mm aggregate from the Tarmac- owned Tyttenhanger Quarry, near St Albans. The materials from this source were specially selected because of the regular particle size distribution, which results in a homogeneous and workable concrete mix. Tyttenhanger Quarry has allocated specific reserves to achieve consistent quality from the extracted materials for the life of the project. Using land-based aggregate rather than a marine source also avoids any potentially adverse chloride reaction. The PQ-X cement is manufactured at Tarmac’s specialist facility at Swains Park in Derbyshire. 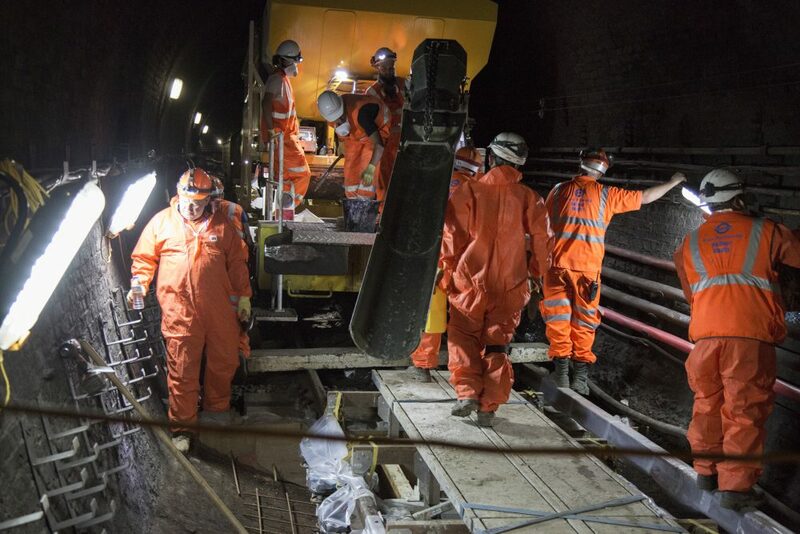 As part of the final refinement and approval of the modified PQ-X cement, the London Underground project representatives were invited to Swains Park to witness a typical pour of PQ-X based concrete and to agree on the appropriate slump characteristic. The concrete performance was then re-engineered by Pozament’s laboratory which is responsible for research and development, together with quality control. The actual mixing of the concrete takes place within the tunnel on an engineering delivery train which includes a special volumetric mixer wagon. The rail-mounted wagon is one of a range manufactured by the Italian company, Blend. This wagon has compartments for segregating the constituent materials, a cement hopper for up to 5.0m3 of the PQ-X cement, a sand hopper of 8.0m3 capacity, an aggregate hopper of 9.0m3 capacity and a 5,000 litre water bowser. The volumetric mixer can be programmed to deliver a specific mix from these compartments. Sand and aggregate are gravity fed onto a conveyor belt and are then transferred to an auger rotating at 300rpm, at which point the cement and water are added. The high speed of the auger mixing process ensures that sufficient energy is imparted to activate the superplasticisers and other additives included in the mix design. The output from the auger is then dropped onto another conveyor belt at a steady rate and delivered to the placement area. The mix is designed to have an S4 slump characteristic. David Sloane, project manager for LU, explained the planning and delivery arrangements. 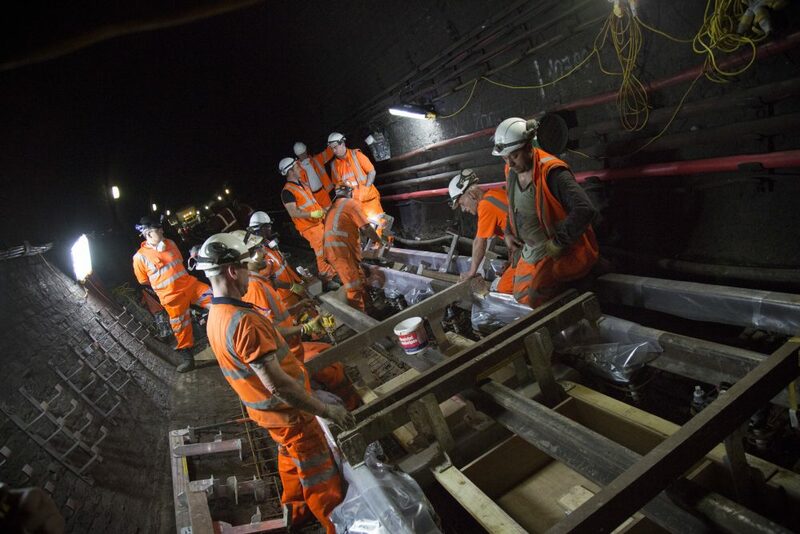 Extended engineering possession hours of 22:00 to 05:30 each night on Monday, Tuesday and Wednesday were taken on the Metropolitan line for installation of the track slab. 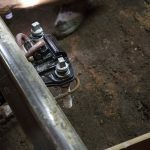 Within this time period it is possible to install 10.5 metres of new track per night. The works are dependent on an engineering train, which consists of locomotive/GP wagon/ mixer wagon/DISAB/GP wagon/locomotive. The first operation is to use the DISAB vacuum machine to excavate all the old track ballast from the length to be replaced that shift. 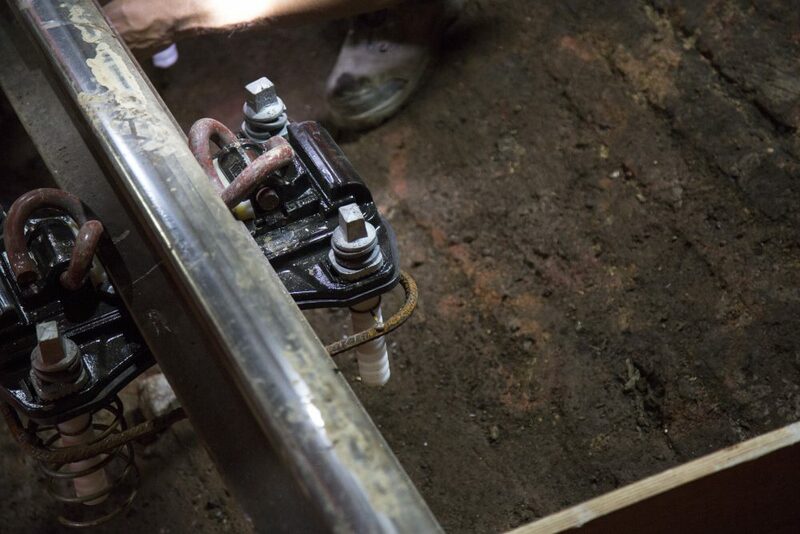 The DISAB process is also able to remove all the old drain components along with the ballast. All material up to the soffit of the rail baseplates is removed, the bullhead rail and chairs having been previously replaced by flat bottom rail and baseplates in readiness for formation of the new track slab. Once the area under the rail and baseplates downwards has been cleared, shuttering is placed ready for casting the track slab. A base reinforcement mesh is also positioned 75mm from the tunnel invert. The overall depth of the concrete slab is typically 400 to 480mm. Mixing, delivery, placement and vibration of the concrete can be achieved within 45 minutes. It is interesting that, in the early stages of the project, it was found that the concrete was not remaining workable for long enough and LU asked Pozament to slow down the mix. It was impressive how they were able to do this very accurately whilst still preserving the required specification and properties of the finished product. Another striking feature of the process is that, in programming the concrete mix, the volume of concrete required for each pour can be produced very accurately. 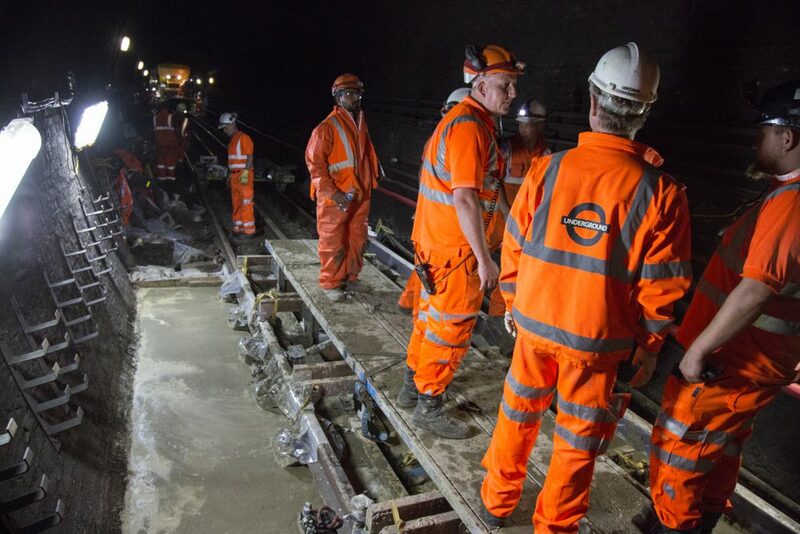 The site team is made up of 16 personnel from the Track Partnership team (Balfour Beatty and London Underground). A new square-section U-shape four-foot drain is cast into the top surface of the slab and is provided with a GRP cover. This drain runs to the end of each tunnel section and then goes through a transition slab at the beginning of each open track section where the drainage crosses into the six-foot drain. 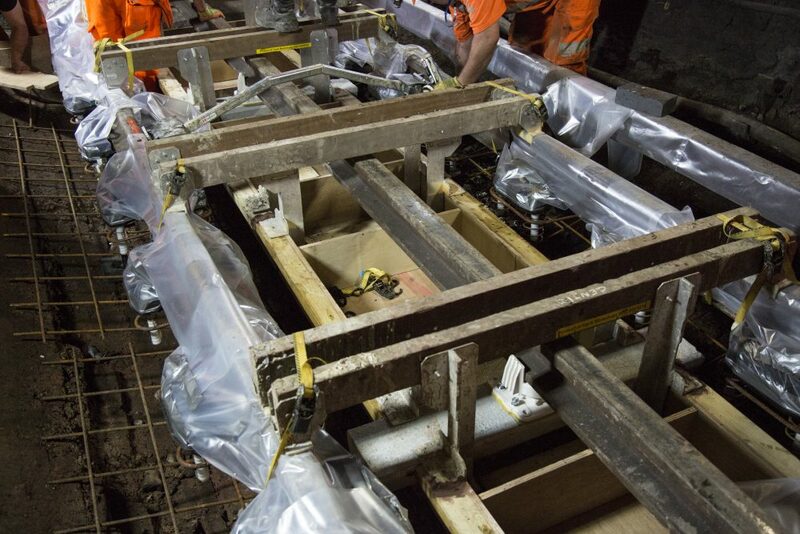 Prior to the works in the tunnels commencing, trials of the concrete placement had been carried out on a mock-up of the tunnel cross-section. This was a full-scale model approximately 15 metres in length, constructed at an LU facility at Northwood. The purpose of these trials was to ensure the feasibility of placing and compacting the mix into the fairly constricted area between the tunnel invert and the shuttering for the surface drain, and to prove the curing and strength gain aspirations of the process were achieved. 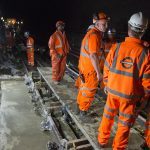 In addition to the mix design for the main work of the track slab, Pozament also produce a rapid-setting flowing repair concrete for application on small sections where it is necessary to effect localised patching and small section slab track pours of approximately three linear metres. 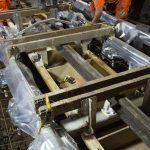 Once the project is complete by mid-2018, London Underground should expect very low maintenance within these tunnel sections for a number of years, having achieved the transition to an innovative track form with minimal disruption to Metropolitan line customers. Pozament can be proud that its expertise and skill in designing specialised concrete mixes has been further refined and applied to a new situation and to one which looks capable of extension more widely within the LU network and on other metro systems worldwide.